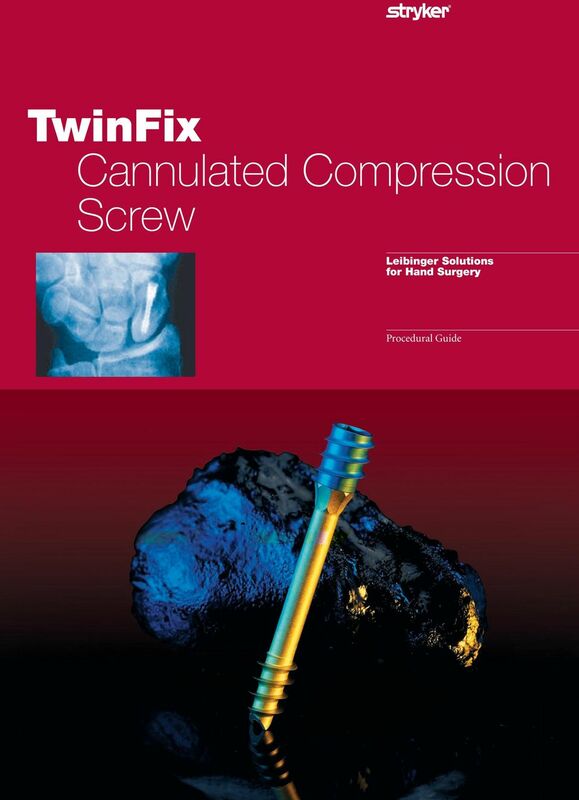 Download "TwinFix Cannulated Compression Screw"
3 Indications Scaphoid fracture Intercarpal arthrodesis Finger joint arthrodesis Corrective osteotomy of hallux valgus Treatment of a scaphoid fracture 1. Insertion of the K-wire Drill and Screw Guide Sleeve Drill Guide for K-wire Drill and Screw Guide Completely assembled The K-wire is inserted using the drill and screw guide. Maximum ulnar inclination of the wrist provides a good view of the scaphoid. Under image intensifier, the K-wire is applied in p.a. projection at the junction of the radial/middle third of the scaphoid tubercle. Ensure that insertion is as far dorsally as possible on the edge of the trapezium. 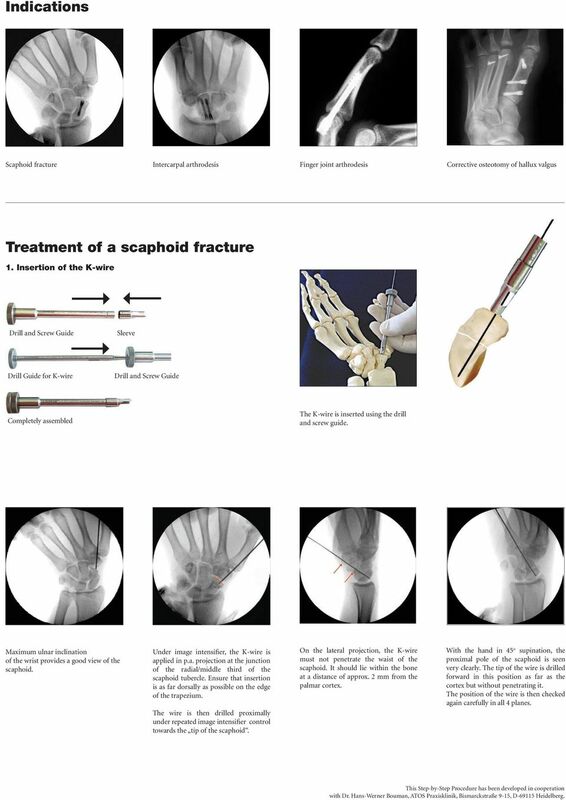 The wire is then drilled proximally under repeated image intensifier control towards the tip of the scaphoid. On the lateral projection, the K-wire must not penetrate the waist of the scaphoid. It should lie within the bone at a distance of approx. 2 mm from the palmar cortex. With the hand in 45 o supination, the proximal pole of the scaphoid is seen very clearly. The tip of the wire is drilled forward in this position as far as the cortex but without penetrating it. The position of the wire is then checked again carefully in all 4 planes. 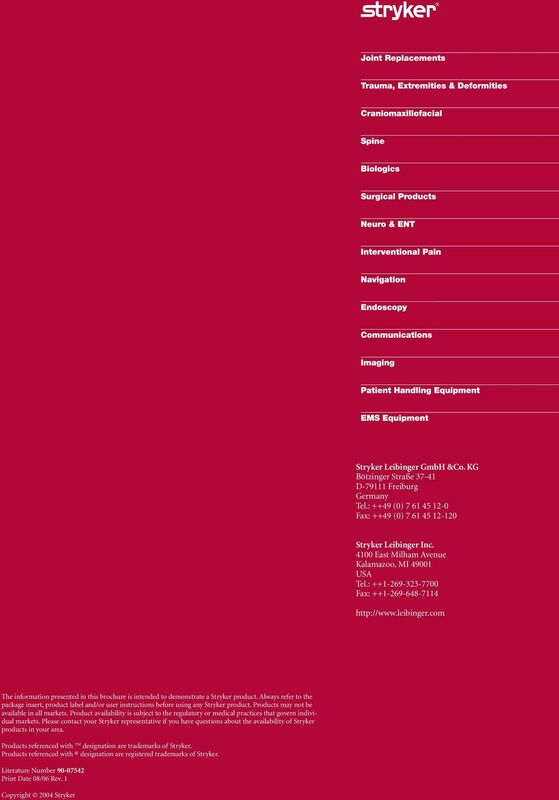 This Step-by-Step Procedure has been developed in cooperation with Dr. Hans-Werner Bouman, ATOS Praxisklinik, Bismarckstraße 9-15, D Heidelberg. 4 2. Checking the position of the Kirschner wire in 4 planes under image intensifier control a.p. (axial alignment of the K-wire in the scaphoid) lateral (position relative to the trapezium and to the waist of the scaphoid) 45 o pronation (view of the head of the scaphoid) 45 o supination (view of the pole of the scaphoid) 3. Determining screw length 4. Drilling through drill and screw guide Measuring the length - the measuring sleeve is inserted over the K-wire. Ensure that the tip sits firmly on the tubercle and that no soft tissue has become interposed. Reading the scale the end of the K-wire defines the length of the screw. Caution: for reasons of safety, the scale shows 2 mm less than the actual length of the wire. The length read off the depth measuring gauge is set on the cannulated drill by means of the knurled screw. The drill guide with sleeve is positioned firmly to the tubercle (caution: interposed tissue). The opening on the sleeve faces towards the trapezium. The drill is inserted into the drill guide over the K-wire and is rotated until it meets the knurled nut. Do not change the angulation of the drill while the K-wire is inserted into the drill. Checking the position with the image intensifier is recommended. Alternatively, drilling can be continued under constant image intensifier control until just before the tip of the K-wire. 5. Loading the screw 6. Measuring screw length 7. Insertion of the screw Selection of a screw shorter than the measured length is recommended. This guarantees that the head of the screw can be submerged sufficiently beneath the level of the cortex and the tip of the screw will not impact on the end of the drill hole in the proximal fragment and force the fracture apart. Check the screwdriver blade is in the locked position (yellow and blue ring visible), center the screwdriver blade and press firmly to remove the screw from the implant module. 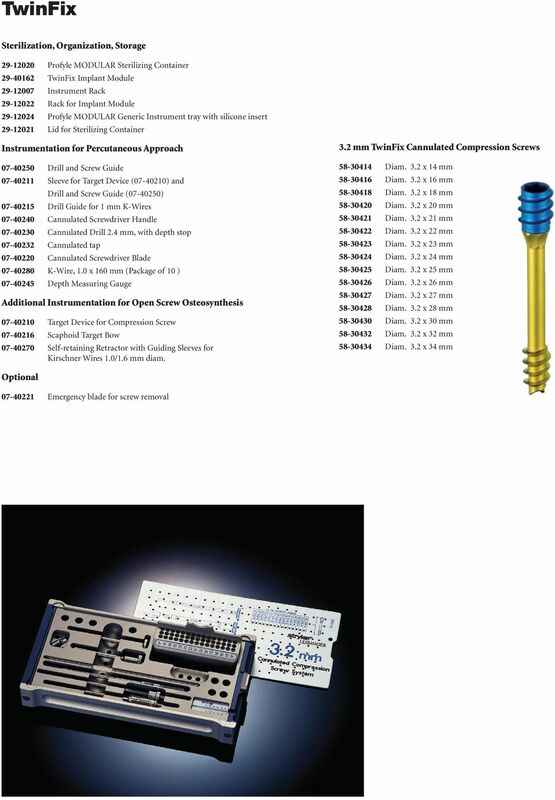 Optional: checking of the screw length on the measuring scale of the implant module. 5 7. Insertion of the screw The screwdriver is locked when inserting the screw (coupling pushed completely forward both blue and yellow rings are visible), so that the screw head and screw foot turn simultaneously. When the reamer below the head reaches the cortex (see illustration), a certain degree of precompression of the fragments occurs. When the screw head is completely submerged in the bone (image intensifier control in 45 o pronation), the screwdriver is unlocked. To do this, the sleeve is pulled backward so that only the yellow ring is visible. Now only the foot thread (gold) can turn. A ¼ rotation is usually sufficient to complete compression. 8. 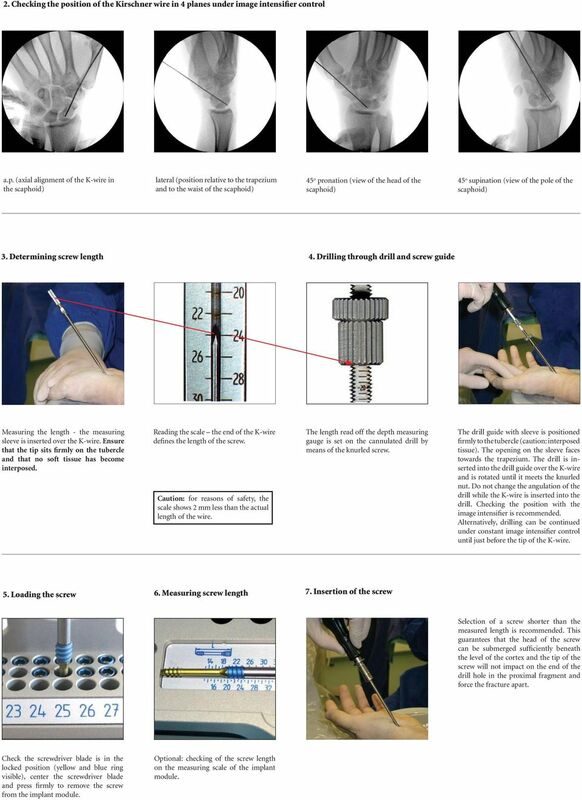 Checking the position of the screw in 4 planes Open treatment of a scaphoid fracture or pseudarthrosis with the target device The required screw length is read from the side of the sleeve on the target device. Caution: When measuring with the target device, a safety distance of 4 mm is included so that the TwinFix screw can be submerged sufficiently beneath the level of the cortex. 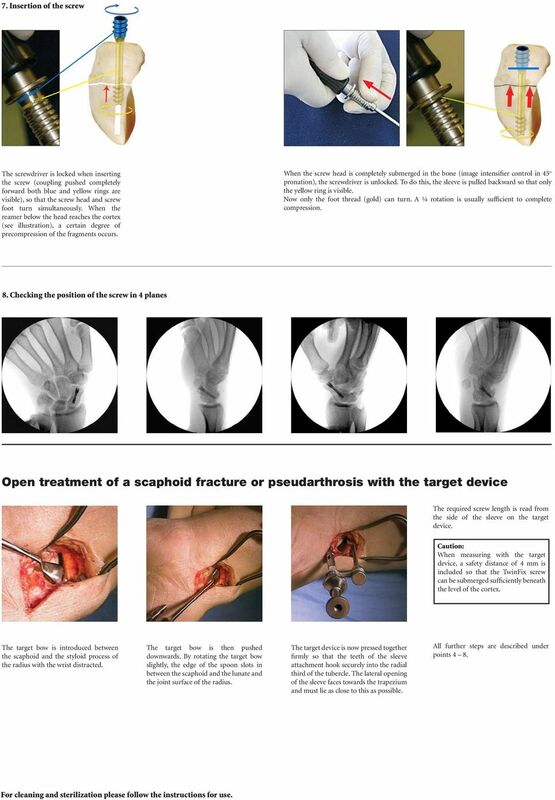 The target bow is introduced between the scaphoid and the styloid process of the radius with the wrist distracted. The target bow is then pushed downwards. By rotating the target bow slightly, the edge of the spoon slots in between the scaphoid and the lunate and the joint surface of the radius. The target device is now pressed together firmly so that the teeth of the sleeve attachment hook securely into the radial third of the tubercle. The lateral opening of the sleeve faces towards the trapezium and must lie as close to this as possible. All further steps are described under points 4 8. For cleaning and sterilization please follow the instructions for use.